The modern discipline of urban morphology gives us a ground for the comparative analysis of cities, which increasingly includes specific quantitative elements. In this paper, we make a further step forward towards the definition of a general method for the classification of urban form. 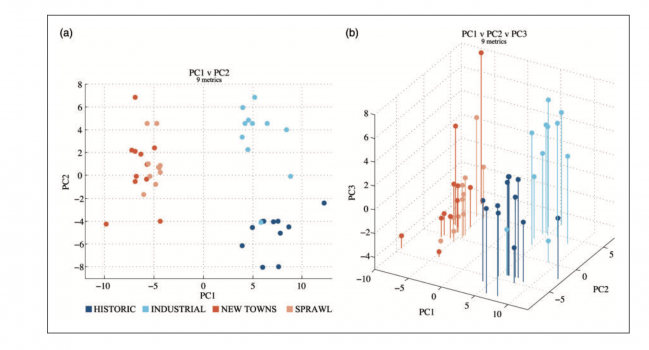 We draw from morphometrics and taxonomy in life sciences to propose such method, which we name “urban morphometrics”. We then test it on a unit of the urban landscape named “Sanctuary Area” (SA), explored in forty-five cities whose origins span four historic time periods: HISTORIC (medieval), INDUSTRIAL (19th century), NEW TOWNS (post WWII, high-rise) and SPRAWL (post WWII, low-rise). We describe each SA through 207 physical dimensions, and then use these to discover features that discriminate them among the four temporal groups. Nine dimensions emerge as sufficient to correctly classify 90% of the urban settings by their historic origins. These nine attributes largely identify an area’s “visible identity” as reflected by three characteristics: 1) block perimeterness, or the way buildings define the street-edge; 2) building coverage, or the way buildings cover the land; and 3) regular plot coverage, or the extent to which blocks are made of plots that have main access from a street. Hierarchical cluster analysis utilising only the nine key variables nearly perfectly clusters each SA according to its historic origin; moreover, the resulting dendrogram shows, just after WWII, the first “bifurcation” of urban history, with the emergence of the modern city as a new “species” of urban form. With “urban morphometrics” we hope to extend urban morphological research and contribute to understanding the way cities evolve.